Community acupuncture has been used successfully to treat a wide range of conditions for many thousands of years. Whether it be pain, stress, anxiety or another condition, community acupuncture can make care accessible and enjoyable. Treatment in a group setting is common in ancient cultures. Community acupuncture offers an affordable treatment plan, that can enable patients to receive frequent treatments. Treatment plans are then more effective, and patients benefit greatly from the synergistic healing effects of group energy. Patients receive acupuncture treatments in a room set up with zero gravity chairs, or tables. An initial private intake session is required to obtain patient health information. Each following session, the patient will be asked to fill out a form to identify their primary health concern for treatment that day. This allows the acupuncturist to treat the patients efficiently in a group setting while maintaining their privacy. The acupuncture sessions are approximately 45 minutes long. During this time many patients take the opportunity to take a short nap, listen to soothing music, meditate, or read. Acupuncture points are chosen either on the ear or distal parts of the body to alleviate the ailment. 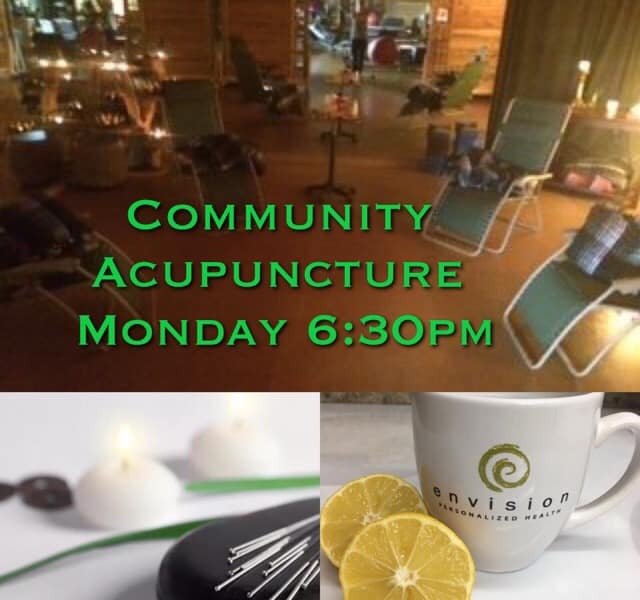 Come in and experience how community acupuncture can benefit your health. Steve Sterling LAc., Envision Personalized Health's community acupuncturist. Holds a Master’s of Science in Oriental Medicine and is licensed by the State of California for Acupuncture. Along with being a Licensed Acupuncturist, Steve is aslo a Massage Therapist, Holistic Health Care Practitioner HHP, and Functional Medicine Practitioner. With 15 years in practice he has the experience in holistic wellness which enables him to help guide to health and well being.